The AMS quick connect button-and-hex coupling system allows components to connect and disconnect faster and with less hassle than threaded or signature series systems. When in use, the torque exerted on the system is placed on the hex – rather than threads – which makes the quick connect connection durable and prevents the components from binding together. 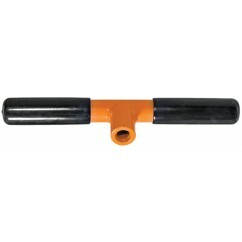 Quick connect connections also allow for reverse augering with either a rubber-coated cross handle or ratcheting cross handle. Most augers and some soil sampling kits are available with AMS quick connect connections, but the connections are not compatible with AMS slide hammers or the hammer- head cross handle. The Quick Connect system is not designed to work with slide hammers, which are necessary for soil core sampler applications. Fast, positive push–to–lock and easy disconnect. Finger ring for AMS Quick Connect button depression included. Allows rotation in either direction.